The universe after the Big Bang has followed a sometimes violent transition to reach the state where we live today. But, is this a steady-state final equilibrium state? Not at all. This section will follow a path through the universe, from the earliest period to what we see today, using easily observable circumstances with more detail on the planets and other constellations, nebulae etc at the end and lastly, the assumption of physical laws of the universe. Names such as Leo the Lion, Orion the Hunter, Pices the Fish, Libra the Scales, and Sagittarius the Archer were used by early observers of the heavens to try to understand the meaning of the what they saw. From the very first observers through the Chinese, Babylonians, Egyptians, Jews, Greeks and Romans and later the Europeans, the order of the heavens was apparent, but the depth of what they were seeing was not obvious. One of the early physical examples of the human understanding of the heavens was the Farnese Atlas in the Naples Museum, a Greek era sculpture showing Atlas holding the round Earth on his shoulder. On the surface of the Earth were various figures representing the constellations, as mentioned above. Early man perceived the structure of the earth to be the firmament (ground) and the heavens, which they visualized to be a bowl of atmosphere hovering above the Earth. It was in this bowl that they perceived the constellations to be situated, and they noted the orderly movement of the constellations with the seasons. Interestingly, they were looking at the very same heavens that we see today, the difference being in the clarity of the skies and the absence of light pollution that they enjoyed. History shows that these early observers were able to identify and record features in the heavens, which in light polluted skies of today cannot easily without the aid of instruments. These early observers in fact were able to see to the ends of the Milky Way galaxy and beyond, even though they thought that what they were seeing was right above their head. Star atlases such as Kanas (2007) give good historical background on the constellations. 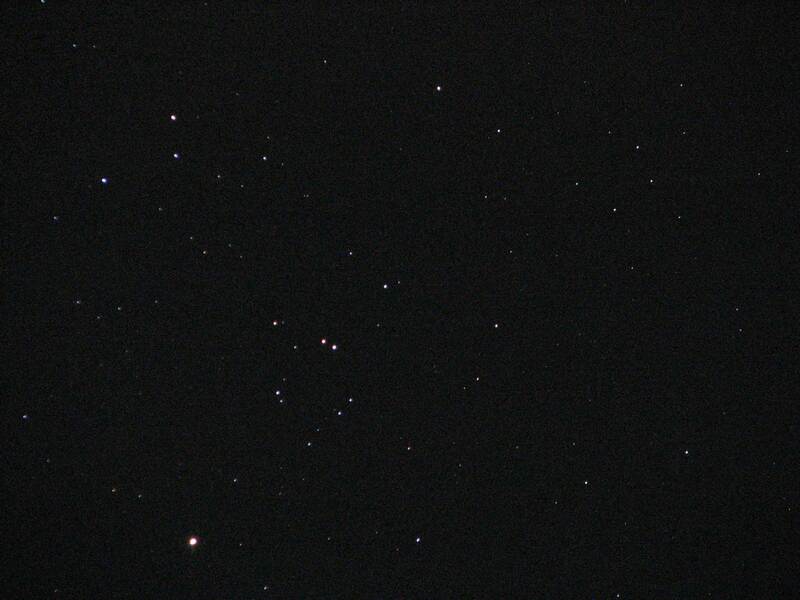 An example of the depth of the universe that was observable by these early sky watchers is in the constellation Sagittarius, which appears low in the Southern sky in the summer. The constellation Bootes, with the star Arcturus, was an early Mesopotamian constellation, developed by the Assyrians between 1300 and 1100 BC. It is included in Ptolemy’s classic Almagest Star Catalog. Arcturus was from Aratus born in 315 BC in south Turkey. In the Northern hemisphere Arcturus rises in the Northwest in February and sets in September in the Northwest. Arcturus is identified as The Bear in the Hebrew writing Job 9.7-9 where God commands the sun to not rise. Job was written from 1009 to 1050 BC. In classical literature Bootes is identified as The Herdsman. My goal was to work from actual experiences and the photos on these pages are mine, which explains the varying quality. Some are taken at “dark sky” locations, which is needed to see the full expanse of the heavens. 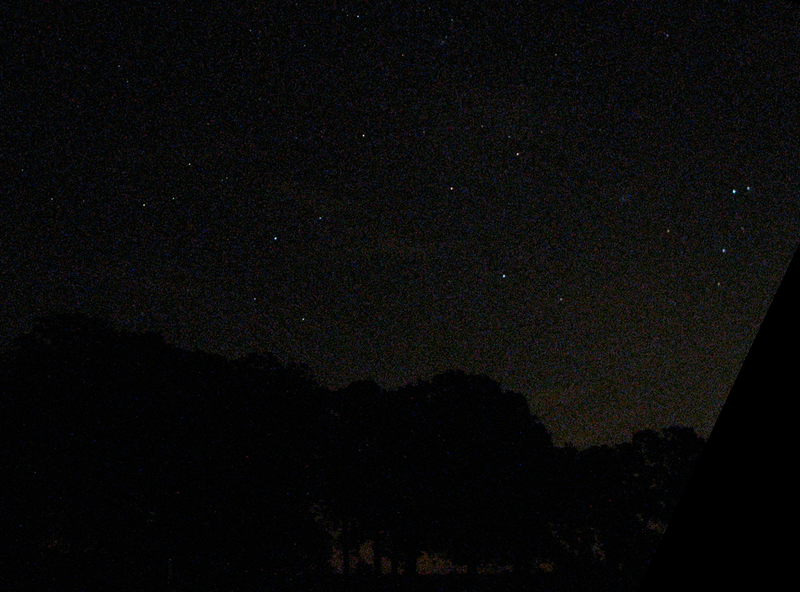 Others are taken where there is appreciable light pollution, but where the ancient constellations can still be seen. Scorpius 061612 Canon S2IS 15s, 2.7, ISO 400 on hinge tracker at Regina Caelorium Observatory, Wheelock Tx. 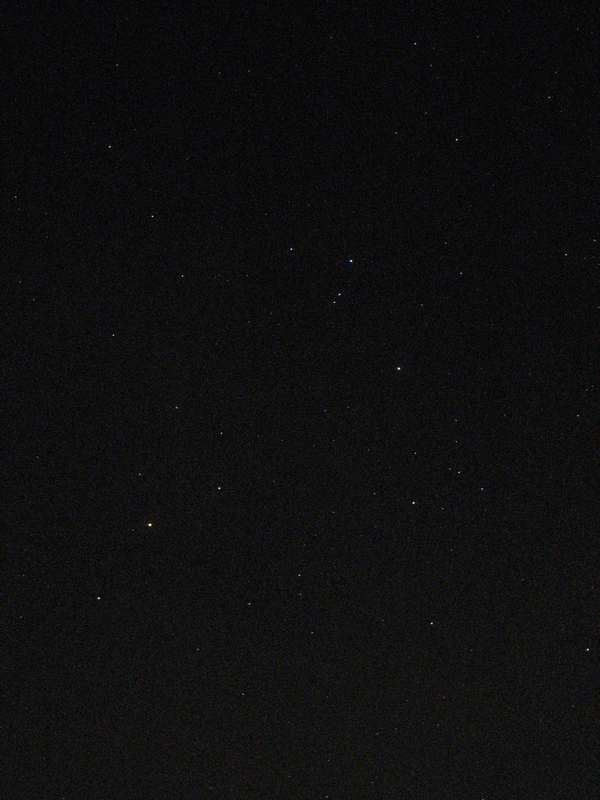 Scorpius, i.e. the scorpion, was identified along with several other constellations, around 3000 BC by the Sumerians. It is a late Winter to Fall constellation, rising in the Northern hemisphere in late January and setting in the Southwest in September. The star Antares is in Scorpius and the constellation Sagittarius follows Scorpius in a similar pattern. Sagittarius 061612 Canon S2Is 15s, 2.7, 400 on hinge tracker at Regina Caelorium Observatory, Wheelock Tx. Orion puts on a spectacular display all Winter, rising in the East in October and setting in the West in April. 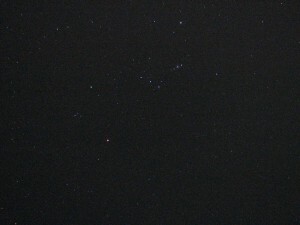 Stars Betelgeuse and Rigel are in Orion. It was first mentioned by the Egyptians around 1100 BC, and is mentioned in the Hebrew book of Job 9. 7-9 and Job 38.31-33 dating 1009 to 1050 BC. Betelgeuse is a supergiant star in Orion’s shoulder and Rigel is a bright bluish start in the heel. 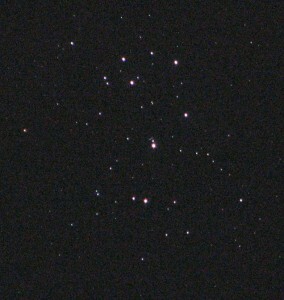 The Great Orion nebulae in Orion’s sword is easily seen with binoculars. Other notable super giant stars and nebulae are in Orion. 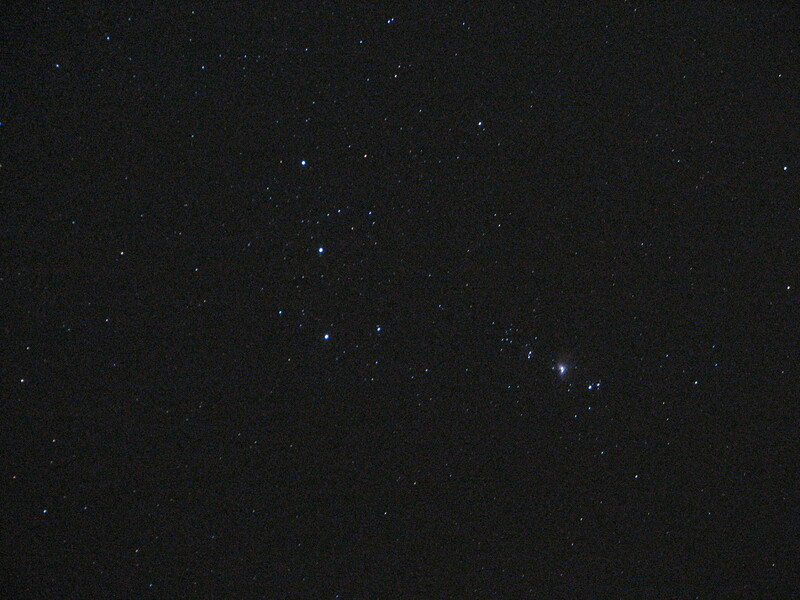 Orion’s belt is easily identified, contains three very bright stars and is composed of massive, super giant stars. For example, Alnilam, the middle star in the belt, is a large, blue supergiant, the 30th brightest star in the sky and 4th brightest in Orion, and is 24 times larger than our Sun. 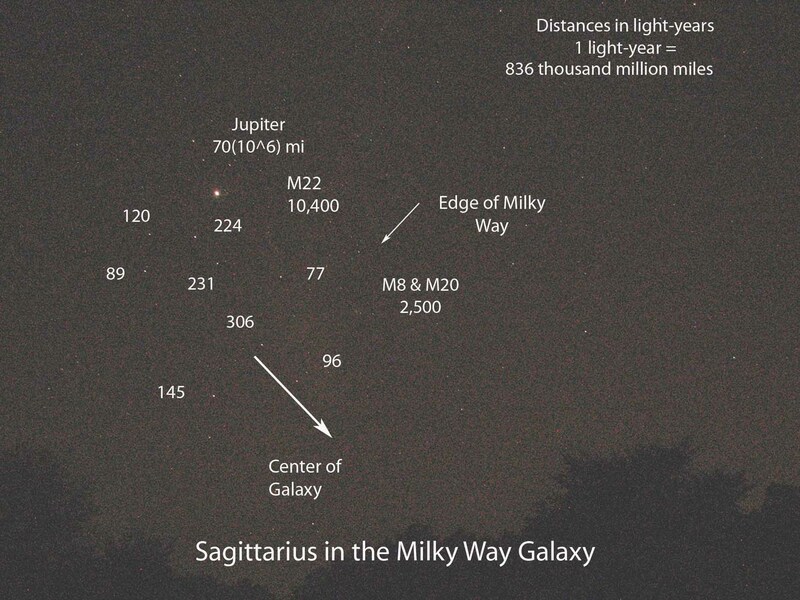 In the Summer of 2008, Jupiter was moving through Sagittarius, which was situated low in the Southern sky. This photo was taken in bad skies, but, nonetheless shows some notable characteristics of the constellation and the skies around it. Jupiter is the nearest object, located 70 million miles from Earth. Distances to the various stars and nebulae are indicated, with the nearest object, a star at 77 light years. The globular cluster M22 is fixed in the star system and is 10,400 light years away. In between we have the stars forming the teapot of Sagittarius from 77 to 306 light years away. The furtherest are the deep sky objects, nebulae M8 and M20 at 2,500 light years distance from Earth. Finally, we note the arrow of the Archer pointing to the center of the Milky Way galaxy. The spectacular feature of these photos is not what is shown here (each of the objects mentioned is seen as a dot, at best), but rather the full views of these dots that have been recorded by modern professional and amateur astronomers. For example, Mark Spearman and Anjal Sharma of the Brazos Valley Astronomy Club have made spectacular photographs of the deep sky objects mentioned here. These are available for viewing at the Yahoo groups web page for the club. Another source is NASA and other images found on the web. In any case, we should be awed by the span of what can be seen in this small area of the sky, even today. Newton’s previously described work on gravitational and momentum forces showed the relationships of not only the planets but also the galaxies, stars and nebulae of the universe. In the formation of the planets from the early chaos, like and dissimilar particles played the gravitational attraction game until a finite number of large masses (planets) was formed. In Encyclopædia Britannica. Retrieved July 1, 2007, from Encyclopædia Britannica Online: HYPERLINK “http://www.britannica.com/EBchecked/topic/413298/Newtons-law-of-gravitation“. The galaxies and star clusters that can be see with both Earth based and space telescopes reveal a great deal about the history of the universe, and our planet. While my equipment is not powerful enough to reveal precise details of these objects, I can access images from the more powerful telescopes for the full detail and confirm from my images that we are looking at the same thing. Remote access to telescopes such as SLOOH enhance the ability of amateurs to image items in the cosmos. Nebulas, such as in Orion (M42), are large clouds of gas and dust from the original Big Bang which is concentrated along the disk of our Milky Way galaxy. They are illuminated by nearby stars, similar to our sun. Of course, much greater detail can be see with space telescopes like the Hubble and with space probes. Nebulae are clouds of space dust. An emission nebula consists of ionized gas and is typically pink or red, with a mixture of blue and violet. A reflection nebula is produced by scattered light from a nearby star, and hence have a color similar to starlight. Color and shape of the nebulae reveal much about their makeup as well as the details about the stars illuminating them. Spectral scans (color) reveal the chemical composition of both the stars and the nebulae. Star illumination is due to nuclear fusion of the elements which generates both energy (heat and light) as well as a new element. Nuclear fission reactors used on Earth generate heat for driving turbines which generate electricity. In this process, both heat and light are produced, as also occurs in the fusion of the stars. The pool of the reactor at Texas A&M University Nuclear Science Center shows the blue glow at the bottom which is the result of light emitted by the nuclear reaction. This light is similar to that experienced in the nebulae. Our galaxy (the Milky Way) is one of several million in the universe. 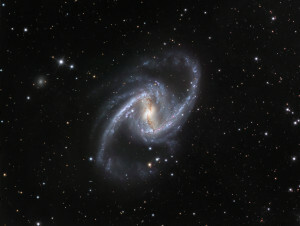 It is a barred galaxy with a diameter of 100,000 light-years and our solar system is located approximately 30,000 light-years from the center of the Milky Way. 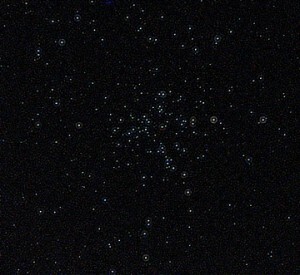 Star clusters are generally one of two types, open or globular. They appear differently (as the names imply), and have different origins. 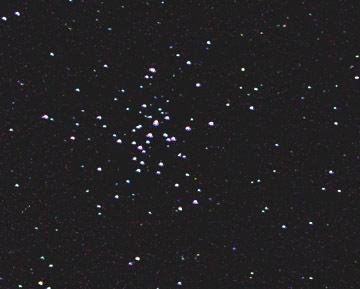 Open clusters have stars spread over a wide field while globular clusters are more gathered into a ball. 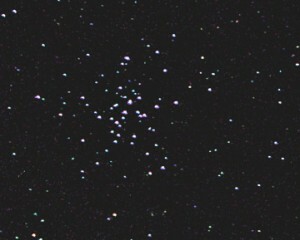 Open clusters typically lie in the plane of the galaxy and are relatively young. Pleiades, for example, is only 7,000 light-years away and is 100 million years old. 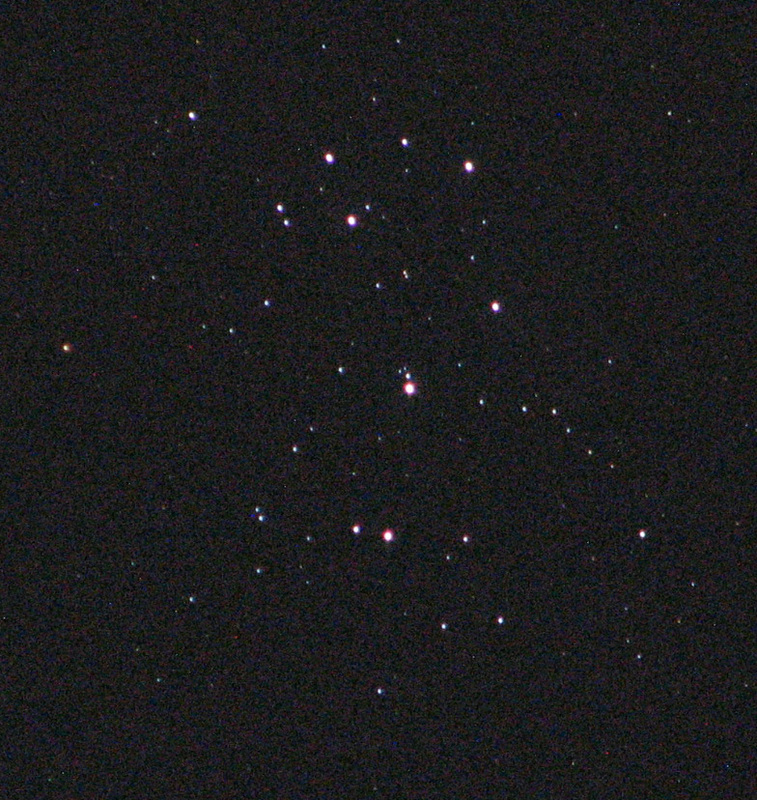 The dust caused by the formation can still be seen in some open clusters. In these associations the stars relationship is typically a result of gravitational action. They might be 30 light-years across. Globular clusters are very compact and are old (12 billion years, typically). They have a common origin and are at the outer reaches of our galaxy. In fact, they form a spherical shell around the Milky Way. They occur within a range of plus or minus 300 light years at the outer bounds of the galaxy. Since they are very old, they are dust free. Silk (2001) describes some globular clusters as very dense clusters of galaxies which would be beyond our Milky way galaxy. The photographs of the open and globular star clusters and the one of the galaxy Andromeda and the Orion nebula give interesting contrasts. Pleiades is 100 million years old, and is very close to us at 400 light-years from Earth. 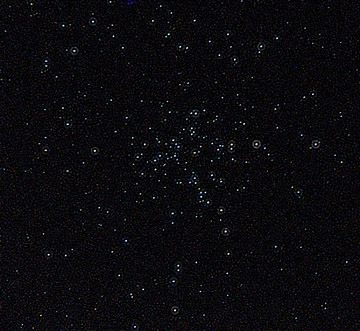 The double cluster in Perseus has a diameter of 70 light-years. The younger of the two clusters is 10 million years old and lies 7,000 light years away from Earth. 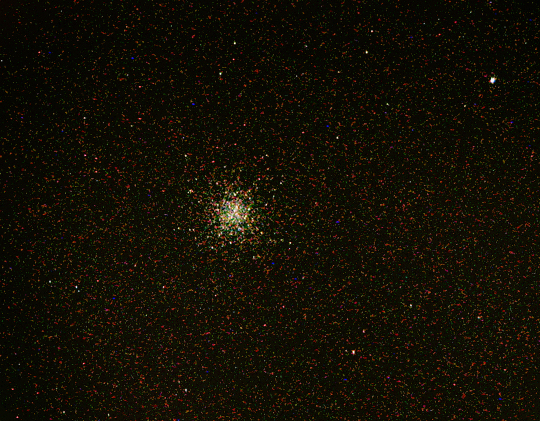 Finally, M15, the globular cluster is farthest away at 31,000-40,000 light-years, and is possibly the most distant object in our Milky Way solar system that is visible from Earth. It is one of the oldest objects in the sky at greater than 10 billion years of age. M15 is the densest of the globular clusters due to core collapse and also contains a planetary nebula (K 648). The brightest cluster stars are red but have an orange color due to surface temperatures lower than our sun. The fainter stars are hotter, giving them a bluish color. Andromeda (M31), on the other hand, is a galaxy totally separate from our Milky Way and lies 2.2 million light-years away from Earth. It is the most distant object visible to the naked eye. Early Babylonian astronomers around 400-500 BCE reported the observation of Andromeda, but it was undoubtedly observed from the very first. M32 is a more distant galaxy (2.9 million light-years away), which appears in the same viewing window as M31. 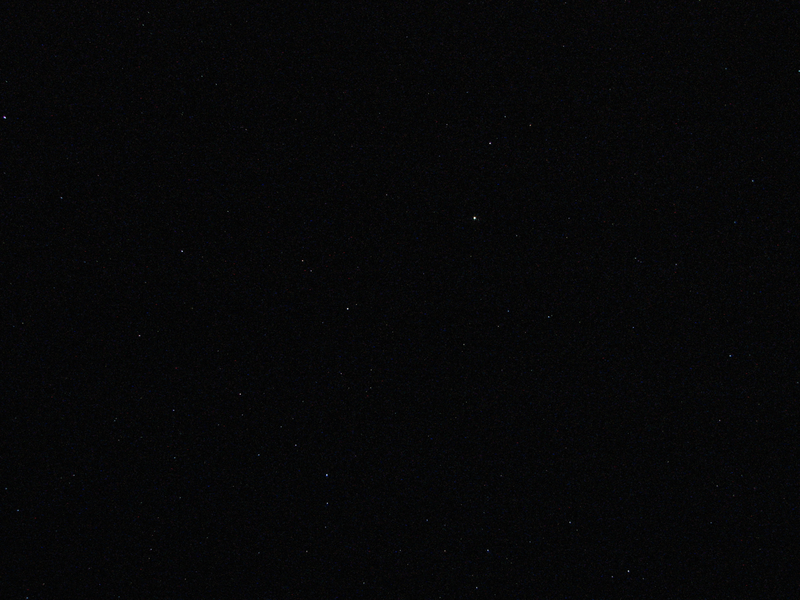 Interestingly, another galaxy, M32, can be seen faintly in the same photo as M31. M32 is 2.9 million light-years from Earth. The super giant star Pollux is shown in the photo with Venus and Saturn. This star is in the Gemini Constellation, and is 33.729 light years from Earth. These super giant stars and an example of the next step in the evolution of our sun. Quasars are unique, ultra intense points of energy which are at extremely large distances and are the core of very distant galaxies. They are powered by gas spiraling at high velocities into an extremely large black hole. Moat of the energy is in the form of infrared radiation with x-ray and radio sources also present. Light is likely produced by accretion by the supermassive black hole. 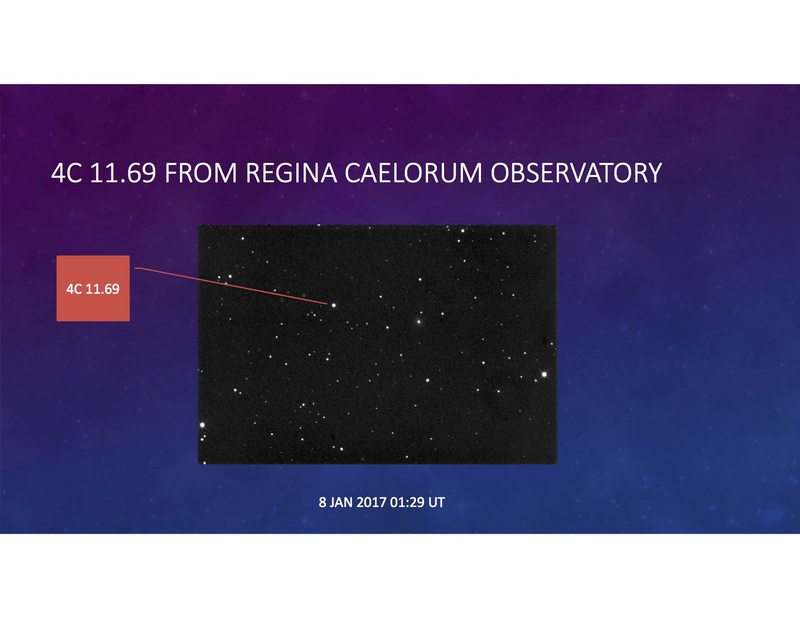 The photo in the link below of Quasar 4C 11.69 was taken by Mark Spearman at his Regina Caelorum Observatory in Wheelock, Texas on 8 January 2017. 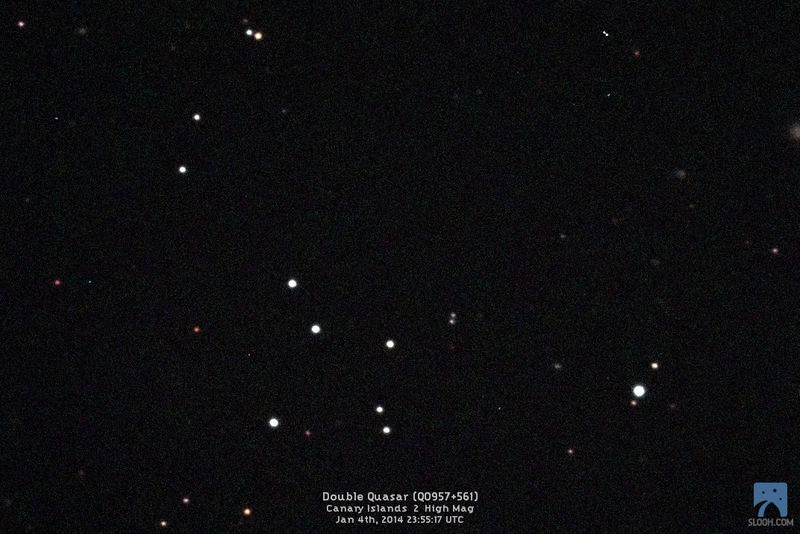 The photo below shows a double quasar as two small blue dots at the the lower center right (at the upper corner of the four star grouping). Because of light diffraction around an intervening object, the image shown gives two arrivals from the same source. This process is also called gravitational lensing. Extensive information on quasars is available from a number of resources, particularly the Encyclopedia Brittanica and Wikipedia links cited below. In the Photo Gallery, the photograph of Andromeda is at the upper end of the capability of my equipment. Other photos of galaxies are from larger telescopes such as Slooh, as noted. There are many excellent photographs of these and other space items on other web sites. For example, the Brazos Valley Astronomy Club site (http://brazosvalleyastronomyclub.org) has excellent views of local astronomers and observatories and information on club activities. Also, the Yahoo group http://tech.groups.yahoo.com/group/brazosastro/ has photos and announcement of club activities. Joining the Yahoo group is required to be able to view the images. Comets are large, icy snowballs in the sky. They generally originate from the Oort cloud or from the Kuiper belt. Their visibility arises from solar radiation of the dust and gas. A comet traveling through space shows some characteristics of other projectiles traveling in air, confirming that space consists of dust and other matter. While there is much order in the universe, there are also signs of disorder. One could say that these are simple situations on their way to achieving order. One such situation is the family of planets in a solar system and the uniformity of the orbital plane of the planets and their rotational axis. A recent Sky & Telescope article (S&T, May 2013, pp. 26 – 31) describes the initiation of planet formation and the migration of planets from one system to another. 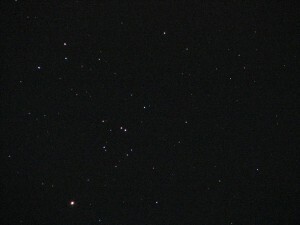 Planet initiation itself is thought to occur in the nebulae such as the Orion Nebulae shown earlier here. Physical attractions for various particles leads to a seed for a planet in the nebulosity which is observed. This in turn attracts more mass which can finally lead to a spherical shape which is a planet. Even here, though, violent impacts from meteors keep these systems in turmoil. So, these are exciting times in which we live. There should be more to come. Awe of the heavens has played a significant role in human development, either by plotting the patterns for use in agriculture or with suggestions that God’s role in mankind’s development is shown in the heavens. Egyptian, Greek, Babylonian, Chinese and Indian cultures wrote about these awesome heavens. Without doubt. the clear, dark, spectacular star filled skies encountered by Moses on Mt. Sinai must have contributed to his experience there. In all cases, the anticipation of other worlds was of interest but beyond comprehension. With the 17th century development of telescopes, man’s ability to observe and possibly quantify these worlds became a possibility, and a source of conflict between science and faith. For example, John Wesley, the founder of the Methodist Church, a scientist and a contemporary of Sir Isaac Newton at Oxford University, accepted the Copernican system for describing the universe which included possibly thousands of “other worlds” (Haas, J. W., Church History, Vol. 63, No. 3, pp. 378-392, Sept 1994, Wesley, J. “What is Man?” Sermon 103). Now we have exoplanets, planets beyond our solar system, being observed by astronomers. (Seager, S., Sky & Telescope, August 2013, pp. 18-26). Analysis of data from the Kepler telescope has identified over 700 confirmed exoplanets with possibly 3500 waiting to be identified. In this group are several which are earth like, i.e potentially habitable, supporting life. Notable in this group are the Kepler-62 system. Evidence of the planets existence includes observations of transits of the host stars, microlensing (diffraction of light from the host star) and radial velocity measurements. The realm of the creation is expanding, before our very eyes. Instrumentation in place enables scientists to very precisely monitor the positions of galaxies, planets and exoplanets etc. in the universe. Paths are expected to be governed by gravitational as well as other body forces. With the new instrumentation, scientists noted that some of the orbiting bodies deviated from the paths predicted by known bodies in space. And, the deviations were predictable and repeatable. Where they did not know of any other bodies in that region of the universe that could be the cause of these deviations, they concluded that some unknown force or body was the cause. Since they could not see the matter, it was labeled “dark matter” and the related energy was labeled “dark energy.” Subsequent investigations have shown that the particles associated with these dark forces simply radiate in a spectrum not in the visible range, hence they are still dark compared to other visible light radiating particles. In fact, we can see only 1% of the particles in the universe. Significantly, it is the gravitational effect of this dark energy that is felt to be the driving force of the expansion of the universe. Additional and more recent news on these topics is in Sky and Telescope January 2013 pp. 26 and July 2013 pp. 16. “And yet, small as is our whole system compared with the infinitude of creation, brief as is our life compared to the cycles of time, we are so tethered to all by the beautiful dependences of law, that not only the sparrow’s fall is felt at the outermost bound, but the vibrations set in motion by the words that we utter reach through all space and the tremor is felt through all time” Maria Mitchell, 1819-1889. Sweeper in the Sky, Helen Wright, The Macmillan Company, New York, 1949, pp. 227. “…just as I believe that the Book of Scripture illuminates the pathway to God, I also believe that the Book of Nature, in all of its astonishing detail – the blade of grass, the missing mass five, or the incredible intricacy of DNA -suggest a God of purpose and a God of design. And, I think that my belief makes me no less a scientist.”Owen Gingrich, Gods Universe, Belknap Press of Harvard University Press, Cambridge, MA 2006., pp. 79. In addition to the above, it is also reassuring to believe that we are bound together by laws of life, which also came with the Big Bang.